About seven years ago, I found myself at a crossroads. Although I had been playing drums since I was a teenager and had accomplished a lot as a professional drummer, I had diverted from the musician’s life in order to make money when I was nearing an age where one is supposed to “grow-up.” I had found myself working in a corporate job I eventually wound up hating. 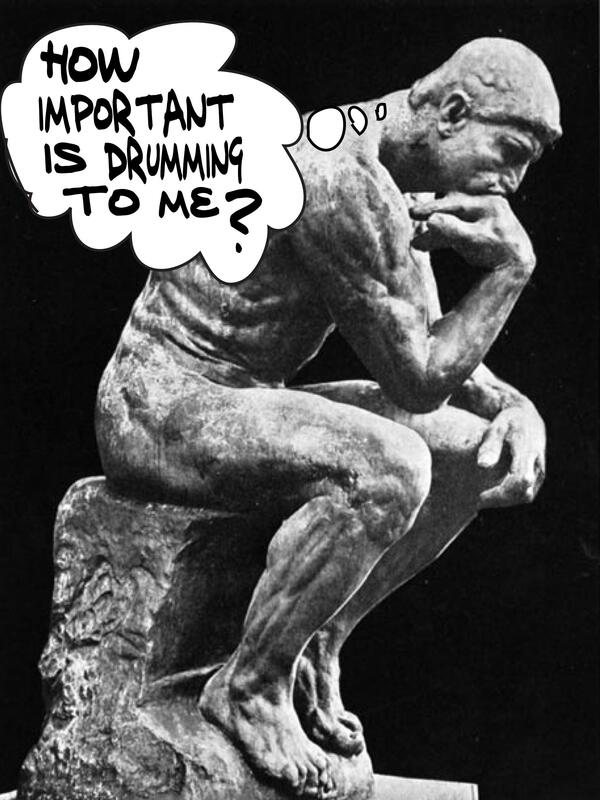 I had never stopped practicing or playing in bands, so I was still very much in touch with my “inner drummer,” but drumming was not–and could not–be my primary focus due to the choice I made to take a corporate position. I was not happy, but I did not know what action to take. The good news is that once I spent the time to think through the mental exercise described below–“The Funeral Exercise”–everything became clear and I knew exactly what I had to do. Here’s how I discovered this important goal clarifying test. During a vacation around this time, I read “The 7 Habits of Highly Effective People.” One of the main themes of the book is that happiness comes when one’s goals and actions are fully aligned. A very simple and seemingly obvious idea, but one that many people overlook. The first part of this equation, of course, is to figure out what your goals actually are. Get the picture? This is such a deep exercise that it goes way beyond drumming. It gets to your core values and how you are leading your life in many, many other important ways. But for me, at the time that I imagined this scenario, it scared the daylights out of me, not because I was a bad person, or because I was leading my life in some sort of morally problematic way, but because I was not doing what I should have been doing with my life. The exercise tells us that the funeral is three years in the future. When I looked ahead three years, based on where I was at that moment in 2004, there was no possible way that I was going to achieve the things that deep down, in my heart of hearts, I really dreamed about. And I use the word “dream” for a real reason. It’s my belief that happiness comes when you dream of something good, something desired, and figure out how to vigorously pursue it. Once I discovered drumming and got deeply into it, many of my dreams became about what I could do with the drums, and how the drums could be a big part of my life. To give you insight into the depth of my desire, I want to describe I dream I had. In my twenties, I dreamt that I went to see Tony Williams play with his quintet at The Village Vanguard. In that dream, while Tony was playing, he looked directly at me–there was no mistaking that he was looking at ME,and he winked and nodded his head. Tony was telling me that I was a good drummer, that I could do anything with the drums that I wanted to. I have never forgotten that dream and I’m sure I never will. It was shortly after I completed the “7 Habits” funeral exercise that I decided I had to return to the drums in a major way. I started to plan my escape from corporate life. In 2006, I quit my job and rented a practice space in Brooklyn, beginning my long journey home. I like very much your article. I’m in this crossroad, and I don’t know what I’d like to do in my life. The funeral exercise is fantastic and impressive too. I’ll stand alone one afternoon, and I’ll think about this. I must say your writing is very motivating to me .I have never read anything like it .The way you story book it seems very logical honest and true.I started playing at 50. I am now 57 and I seem to be stuck thinking I maybe to old to be able to learn so much to be really good in my life time that I have left ? I am going to try to do as you say starting today.I will update you in time. Mark thank you so much for your interest to share you thoughts,time and your life with all. p.s Mark am I to old ? I’ll say this again: your blog is excellent. It always makes me think a lot. Thanks. I had my moment in 1996. I was landscaping and miserable but one important thing happened: I met Joe morello who not only taught me how to play but taught me to be confident that if you pursue your dreams to the fullest, you will succeed. Today I solely play and teach drums and music theory and have never looked back. Visualize where you want to be and what you want to be able to claim when you cash in your chips. Seek knowledge in every corner and find those who are positive and believe in you. Hi Rob- thanks for telling that story. I agree wholeheartedly! thanks for reading. Great perspective and motivational. Thanks. Hi Fred- Thanks for the compliment—it means a lot. You’re welcome and thanks for reading.